A volcanic eruption east of Iceland’s Eyjafjallajokull glacier has forced the evacuation of more than 500 people and the cancellation of all flights to and from the island, the Department of Civil Protection said. Farmers in nearby areas have also been told to leave their homes and the Icelandic Red Cross has set up three emergency centers to assist the evacuees, the department said on its Web site. The volcano, which hasn’t erupted for more than 1,000 years, is spewing lava from 15 places, the department said. 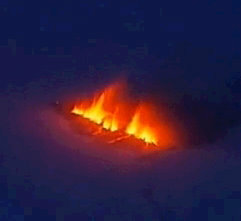 The eruption started at about 10 p.m. local time last night east of the north Atlantic island’s fifth-largest glacier. The volcano erupted along a 1 kilometer-long (0.6 miles) rift, running from northeast to southwest.